Ever invested in expensive skincare, only to find that the product does not work for you, or worse, breaks you out? I bought two bottles of Lancome Visionnaire as soon as it came out, after all the hype about the international waiting list. Wham - my face was an explosion in a fireworks factory. Luckily for me, I was able to palm them off on my Mum who was not affected adversely by the product. Most brands do not give out samples these days unless you buy something from their counters first, which means you try-when-you-buy instead of try-before-you-buy. Fortunately, several brands now offer discovery kits with trial sizes of their key products, so you can actually go through a whole routine for a couple of days, before deciding to invest further. Plus, these are ideal for travel. Here are a few sampler kits that I have tried over the last few months - individual reviews to follow later. These would also make nifty gifts for Mothers' Day, birthdays or special occasions. Everything shown here ships worldwide. 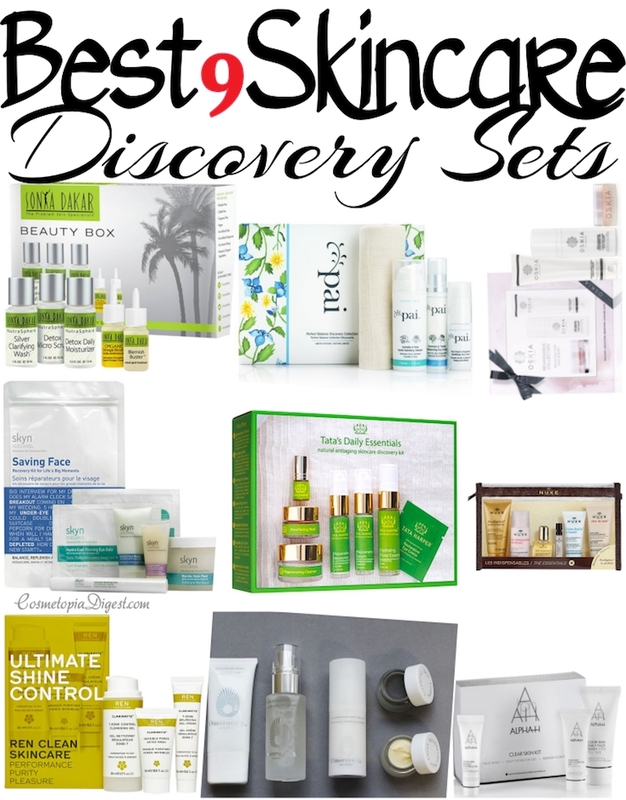 Scroll down to know more about nine of the best skincare discovery and starter sets available. The external packaging of these is more utilitarian than fancy. Many of these include full-sized products. 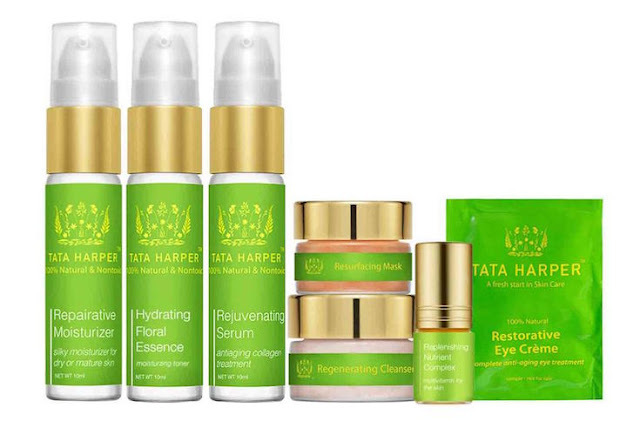 Brand: All-natural fragrance- and chemical-free British skincare brand best known for their Rosehip oil and Bioaffinity Tonic Spray. I ADORE this brand. Contains: Camellia and Rose Gentle Hydrating Cleanser. Rice Plant and Rosemary BioAffinity Tonic. Geranium and Thistle Rebalancing Day Cream. Cleansing cloth. Sizes: 50ml, 12ml, 10ml, respectively. Size and cost of full-sized products: £25.20 (100ml), £30 (50ml). £34 (50ml), £3 (cloth), respectively. Thoughts: I love EVERYTHING! This kit is awesome value for money and offers a complete regimen including the cleansing cloth. What would I buy? I've already bought the tonic and the cleanser, full-sized. I also want the day cream. Brand: Aussie brand founded by woman who had bad cystic acne. Most famous for Liquid Gold. Everything I've tried from them so far works beautifully. Contains: Daily Face Wash, Daily Hydrator Gel, Blemish Control Gel. A cleanser, moisturiser, and spot treatment. Nice. Sizes: 30ml, 15ml, 7.5ml respectively. Size amd cost of full-sized products: £35 (200ml), £21.60 (50ml), £17 (20ml), respectively. Thoughts: A nice regimen kit for acne-prone skin. To make this kit mindblowing, they could have added a small sample of Liquid Gold. Dry and sensitive versions as well as Liquid Gold intro kits are also available. What would I buy? Bought all three, full-sized. Brand: British brand named for Greek words for "delivery nutrients" and "beauty". Contains miracle ingredient MSM, a form of organic sulphur. Founded by Georgie Cleeve who first used MSM to repair knee cartilage after a skiing accident. Contains: Renaissance hand cream, gel cleanser and mask. Sizes: 100ml, 100ml and 50ml respectively. Cost: £90 BUT everything is full-sized. Costs of full-sized products individually: £21, £28, £48.50. Thoughts: Everything is full-sized - glory be! And it comes in a beautiful keepsake box. BUT. I cannot explain the hand cream, sorry. Why not add a moisturiser, or another cleanser instead? Or the Get Up And Glow serum? What would I buy? The cleansing gel. Maybe the mask as well. But not the hand cream. Plenty of good hand creams out there for a lower price. The other two products perform far better. Brand: 100% natural and non-toxic. Actual manufacturing is not outsourced. A by-word in luxury skincare. 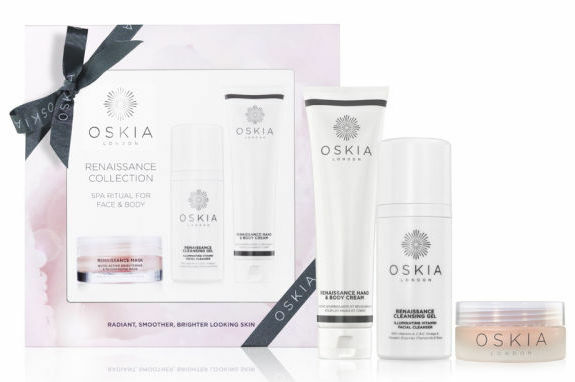 Contains: Restorative Eye Cream, Resurfacing Mask, Replenishing Nutritive Complex, Regenerating Cleanser, Repairative Moisturiser, Rejuvenating Serum, Hydrating Floral Essence. Sizes: 1ml, 7.5ml, 3ml, 2x10ml, 2x15ml, respectively. Sizes and cost of full-sized products: £75 for 15ml, £47 for 20ml, £39 for 10ml, £32 for 50ml, £84 for 50ml, £80 for 30ml and £54 for 50ml, respectively. Thoughts: Loaded with products; everything for a complete regimen. Good bang for your buck because of the number of products and the comparative costs of the full-sized versions. There is another Glow on Demand kit from Tata, with fewer products (four), each at 15ml, for a total of £36. I skipped it because one of the products was a cheek tint. What would I buy? The floral essence and the cleanser. I want more when my ships come in. Brand: Hungarian; delves into 2,000-year-old beauty tips and uses mineral-rich waters. Contains: Cleansing Foam, Queen of Hungary mist, Illuminating moisturiser, Deep Cleansing Mask, Thermal Cleansing Balm. Sizes: 30ml x 2, 20ml, 5ml x 2, respectively. Costs of full-sized products: £44 for 150ml, £48 for 100ml, £85 for 50ml, £60 for 50ml, £48 for 50ml, respectively. Thoughts: I love everything but the cleansing foam. Why add a cleansing balm and a cleansing foam? Could have added the night cream instead. Nice value for money if you look at comparative prices of the full-sized versions. What would I buy? I would avoid the cleansing foam. The balm, definitely, and the mist. The mask is nice, too. 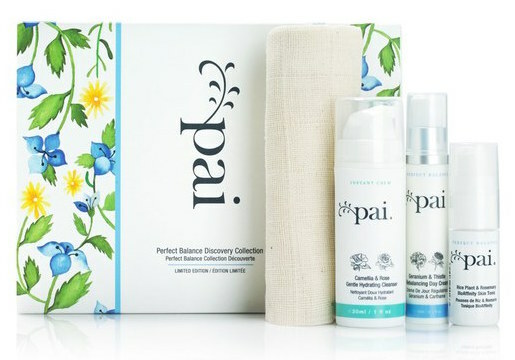 Brand: Organic, paraben-free range for stressed skin; contains Artic botanicals and super-fruits and glacial waters. Contains: Nordic Skin Peel Pads, Pure Cloud cleanser, Antidote Cooling Daily Lotion, Icelandic Relief eye pen, Hydro Cool Firming Eye Gel pads. Sizes: 60 pads, 1oz, 0.5oz, 0.14oz (one full-sized pen), two gel pads, respectively. Cost: £38 - cost of the full-sized peels pads alone! Costs of full-sized products: £38 for 60 pads, £22.50 for 1oz, £17.50 for 0.14oz; £25 for eight pads. Thoughts: Pads and eye cream are full-sized. They also have a skin hangover kit with a mask in lieu of the glycolic pads. EXCELLENT value for money. It's like you buy the glycolic pad, but get the eye pen and three samples free. What would I buy? The pads, for sure, and the cleanser. Saving the eye gels and haven't tried the moisturiser. 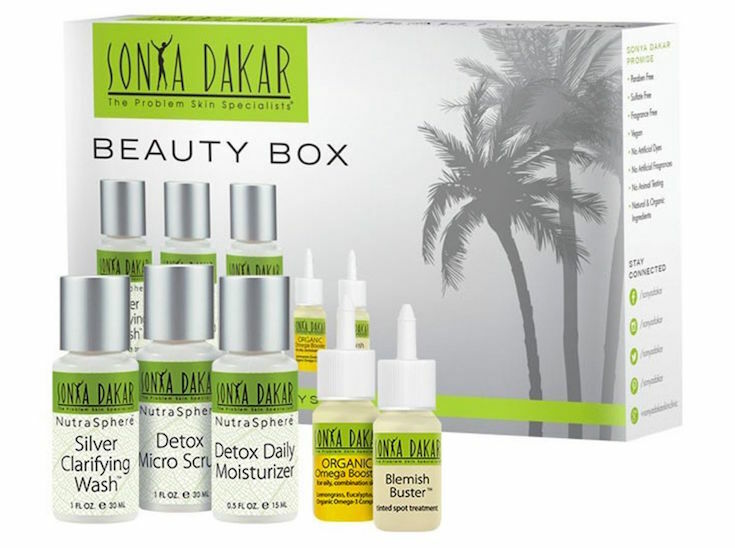 Brand: Founded by skin care expert (since 1971), Israel-born Sonya Dakar. Products are used in the Sonya Dakar skincare clinic in Beverly Hills. Range especially suitable for problem skin. Contains: Silver Clarifying Wash, Detox Micro Scrub, Detox Daily Moisturiser, Organic Omega Boost (facial oil), Blemish Buster spot treatment. Sizes: 30ml x 2, 15ml, 2.5ml x 2, respectively. Costs of full-sized products: $59 for 113ml, £44 for 75ml, $95 for 50ml, £39 for 15ml and £22 for 15ml, respectively. Thoughts: A toning product or a sample of their famous Volcanic Mask would have made this box perfect. Good for acne-prone skin. An anti-ageing version is also available. What would I buy? The Silver Clarifying Wash and the Moisturiser. Not a fan of the scrub. Brand: Uses only plant- and mineral-derived ingredients. Been around for 15 years now. Contains: Clarimatte™ T-Zone Control Cleansing Gel, Clarimatte™ T-Zone Balancing Gel Cream, Clarimatte™ Invisible Pores Detox Mask. Sizes: 50ml, 15ml x 2, respectively. Costs of full-sized products: £16 for 150ml, £22 for 50ml, £19 for 50ml, respectively. Thoughts: Nifty, low-cost set. I also have the ClearCalm trio and ADORE the clay cleanser. Great regimens for acne-prone skin. What would I buy? Everything. If I had to pick only one, it would be the amazing cleanser. I want a dozen of those. Brand: French skincare brand founded by Aliza Jabès. Began as a skincare lab in the 1990s. USP: combining nature and luxury. Contains: Prodigieux Shower Oil with Golden Shimmer, Micellar Water (reviewed here), Huile Prodigieux Dry Oil (Reviewed here), Prodigieux Perfume, Moisturising Cream, Hand Cream. Sizes: 30ml, 35ml, 10ml, 1.2ml, 15ml, 30ml, respectively. Costs of full-sized products: £10 for 200ml, £14 for 200ml, £17 for 50ml, £43.50 for 50ml, £25 for 50ml and £11 for 75ml, respectively. Thoughts: A facial cleanser would have perfected this. The contents of this kit have changed slightly from the time I bought this - see here for my original review of this kit. 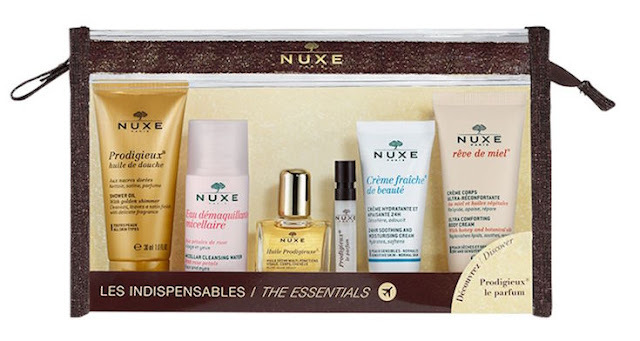 Why is a shower oil in this kit? Could have added a Creme Fraiche face mask instead. What would I buy? The dry oil, forever! Also love the micellar water. Ever bought expensive skincare that turned out to be a disaster? Tell me in the Disqus comments widget below. Also tell me if you want one (or more) of these reviewed first.